Bavaria Cruiser and Vision Line yachts and S Line motorboats already represent excellent value for money. But between now and 31 January 2017 you have the option to make your boating budget work even harder across the range with highly atractive additional exterior enhancements and interior fittings. You even get a voucher for wet weather clothing! Most people are thinking about Christmas right now but we're already well into the final stages of planning Tingdene's traditional New Year's party at the London Boat Show on 6-15 January 2017. Did you miss the Southampton Boat Show or would you like a second look at boats we were showing there, out on the pontoons and in our stand? Then no problem! Just make a date to visit Thames & Kennet Marina's latest open weekend which commences on Friday 30 September and runs until Sunday 2 October. Tingdene's top 20 at the Southampton Boat Show! Marking the pinnacle of a very busy summer, Tingdene Boat Sales and its sister company, Tingene Marinas, will offer no less than 20 different locations around Mayflower Park, afloat and ashore, at which visitors will be able to meet up with staff and view the extensive range of boats and marinas on offer from both companies. Tingdene's picturesque Upton Marina on the River Severn will play host on 20-21 August 2016 to a stunning quartet of new motorboats from the Tingdene Boat Sales stable, including the Broom 35 Coupe, Antaris Sixty6 sloop, Bavaria S36 sportscruiser and the innovative Bavaria E40 which is currently on its European maiden tour. Plus you'll be able to view a wide selection of pre-owned boats. In order to mark the official opening of its new boat sales office at Portishead Quays Marina, Tingdene Boat Sales, in partnership with Quay Marinas, is holding an open weekend on 13-14 August. The Open Weekend is a great opportunity for families to visit to learn more about boating from Tingdene’s local expert and qualified Yachtmaster Jason Rowles, who is very familiar with the waters of the Bristol Channel and is well known in the region. Local RYA Training Centre Compass Sea School will be attending both days to explain how to get afloat on all types of boats, large and small and the RNLI Portishead station will also be present on the Saturday to provide safety on the water advice. Tingdene Boat Sales, in partnership with Quay Marinas is opening a new and bespoke boat sales office at the award winning Portishead Quays Marina, on the Bristol Channel. The Portishead Quays Marina sales office is located in a brand new building on the pontoons of the 5 Gold Anchor 280-berth haven. It is ideally placed to serve the whole of the surrounding area from the Severn Estuary, River Avon and across to Cardiff Bay with a full range of boat sales services including pre-owned boats and new boats from Antaris, Bavaria Motorboats and Bavaria Yachts, Broom Boats, Da Vinci and Viking Cruisers. 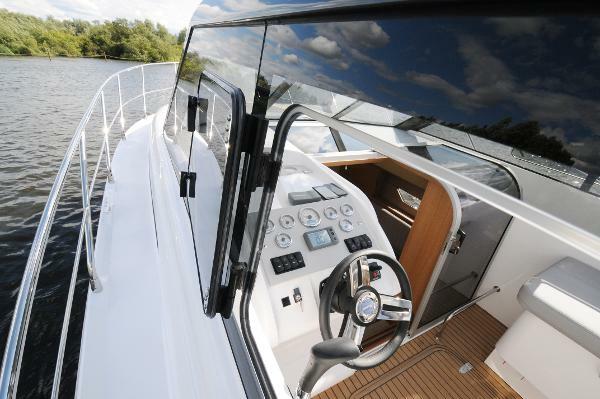 Tingdene Boat Sales has significantly expanded the range of new boats on offer from its 10 sales offices that cover many of Britain’s busiest boating areas. We have been appointed the UK exclusive representative for the Da Vinci motor yacht range from the Netherlands and have signed an agreement to represent Bavaria motorboats and yachts from Germany on the River Thames, Norfolk Broads, Cambridgeshire Ouse, River Severn and Severn Estuary for official Bavaria UK importer Clipper Marine Boat Sales. We have also announced our partnership with Bushnells Boat Sales and Marine Services to sell Antaris, Maril and Makma sloops from the Netherlands. All three ranges join Tingdene Boat Sales’ existing representation of Broom Boats and Viking river and canal cruisers. It's a busy month ahead for Tingdene Boat Sales as we will be appearing at several key regional boat shows in the UK – the Horning Boat Show in Norfolk, the Poole Harbour Boat Show in Dorset, the Crick Boat Show in Northamptonshire and then the Beale Park Boat and Outdoor Show on the Thames in Berkshire. Tingdene Boat Sales is expanding the services it is able to offer right across the UK by opening a new sales office on the River Great Ouse, in the heart of the popular waterways of The Fens. The acquisition last week by Tingdene Marinas of the 200-berth Hartford Marina, in Huntingdon, Cambridgeshire, provides the group with an ideal location between its marinas on the Norfolk Broads, the Thames, the Wey navigation and the Severn. The Great Ouse can be reached via the Middle Levels and River Nene from the canal system, which makes Hartford equally suitable for river cruisers and narrowboats. Tingdene Boat Sales will be fully supporting this year’s Broom Boat Show 2016 at Brundall Marina on the Norfolk Broads. The date to note is Saturday 16 April 2016 between 10am-4pm. Visitors will be able to view the entire Broom Boats range, from the 30 and 35 coupe, to the Broom 370, 395 and 430 aft cabin models. Factory tours will be available and you’ll be able to see the launch of the fully refurbished 1957 Broom Robb Jenny Wren – as featured on BBC1’s Holidays of a Lifetime with Len Goodman and Fiona Phillips. The Tingdene Boat Sales stand B140 will provide a real focal point for all inland waterway enthusiast visitors to the 2016 London Boat Show in January, with no less than five models on display from Viking Cruisers and a brand new Broom 30 HT Coupe and Broom 395 across the corridor on stand A140. Broom Boats are in tow for Tingdene! Tingdene Boat Sales is delighted to announce that it has been appointed as an agent of Broom Boats, the 115-year-old Brundall, Norfolk-based quality builder of aft cabin and coupe motor cruisers for sea, river and European canal use.